By today’s standards, the modest structure on King Street East seems like nothing special, in the 1840s however, it was one of the most powerful money machines in Hamilton. 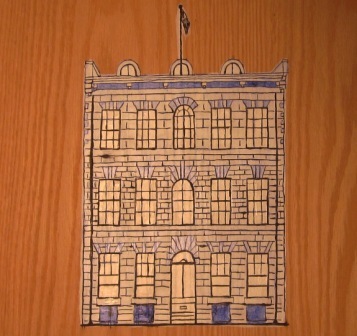 The pen and ink drawing above depicts the original building we now call “the Kerr Building,” likely constructed around 1846. Kerr would then buy and extend his business to the building to his left sometime before the end the 1840’s (not shown in this drawing). Archibald Kerr knew he was building something special: he chose a location that was at the heart of the newly minted city (1846); and he chose to construct his building with stone. At the time, most buildings were still constructed of wood. Hamilton suffered from many fires and as a result, there is not much left of our early history. Really, there is only a handful of pre-1850s buildings left. After the 1840s, fire codes came into existence and builders were eventually required to use stone or brick. To my mind, Kerr was trying to make a statement with the Kerr Building. It showed that he had arrived and was joining Hamilton’s elite society. The source of Kerr’s wealth was the hundreds of people arriving from England and Europe who wanted to take advantage of new farm lands opening up to the west of Hamilton. Arriving with almost nothing, Kerr would exchange their few financial resources for goods they needed to set up a home and farm. This activity made him rich very quickly. In 1836, he and his brother, Thomas Cockburn Kerr, formed “A. & T.C. Kerr and Company.” Ten years later, they constructed the Kerr building on King Street East and then expanded the operations to include the building next door. In 1850, with new partner John Brown, they opened a branch in London, Ontario. During this same period, he founded the Burlington Bay Dock and Shipbuilding Company to help with his importing of goods. He also founded the Canada Life Assurance Company with Hugh Cossart Baker Senior in 1847. So, how wealthy did Archibald Kerr become? 1.) By the early 1850s, Kerr was living at the former estate of Robert J. Hamilton. 2.) By 1853, he had built a beautiful home called “Inglewood” on a large piece of land just west of James Street South and below the mountain. The house still exists but the surrounding property has been sold and developed. 3.) Two years later (1855), Kerr is able to leave the day-to-day operations of the business to his brother and retires to Scotland – leasing a manor house near Edinburgh. So, after only 10 years, Kerr establishes himself as part of Hamilton’s elite. Within 20 years, Kerr is wealthy enough to retire to a manor house in Scotland. To give some perspective to Kerr’s success, this is at a time when most people in Hamilton worked 12 hour days and could only afford to rent a small room or building. No wonder people called Hamilton the Ambitious City. Source notes: Some of the above information was drawn from the Dictionary of Hamilton Biography (1981) by Thomas Melville Bailey. Next Post #SavetheGore – A good Mayor can make the difference!